"I cannot emphasize this enough, any longer-term or larger military operation in Syria by the Trump administration will need to be done in consultation with the Congress. Furthermore, it is the president’s responsibility to inform the legislative branch and the American people about his larger policy in Syria, as well as the legal basis for this action and any additional military activities in that country." “Making sure Assad knows that when he commits such despicable atrocities he will pay a price is the right thing to do.‎ It is incumbent on the Trump administration to come up with a strategy and consult with Congress before implementing it." "I will be reintroducing an authorization for use of military force against ISIS and al Qaeda when Congress returns to session. Congress cannot abdicate its responsibility any longer and should vote on any use of force not made in self defense. This is necessary whether action is taken against terrorist groups or, as here, against regime capabilities." "Assad was warned, repeatedly, by the U.S. and the U.N. that the intentional targeting of innocent men, women and children is intolerable. Now Assad has been caught red-handed carrying out another abhorrent chemical attack, and the administration has taken a measured response." "Building on tonight’s credible first step, we must finally learn the lessons of history and ensure that tactical success leads to strategic progress. That means following through with a new, comprehensive strategy in coordination with our allies and partners to end the conflict in Syria." "This action was appropriate and just." "Resolving the years-long crisis in Syria is a complex task, but Bashar al-Assad must be held accountable and his enablers must be persuaded to change course. I look forward to the administration further engaging Congress in this effort." 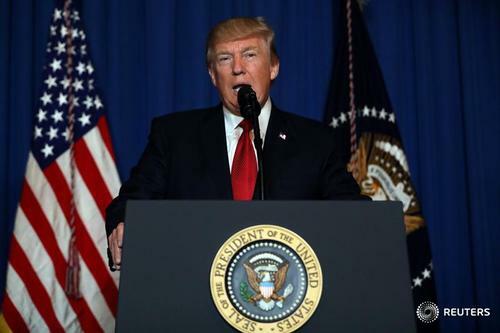 U.S. missile strikes on Syrian military positions serve the goals of "armed terrorist groups" and Islamic State, the governor of Syria's Homs province said on Friday. 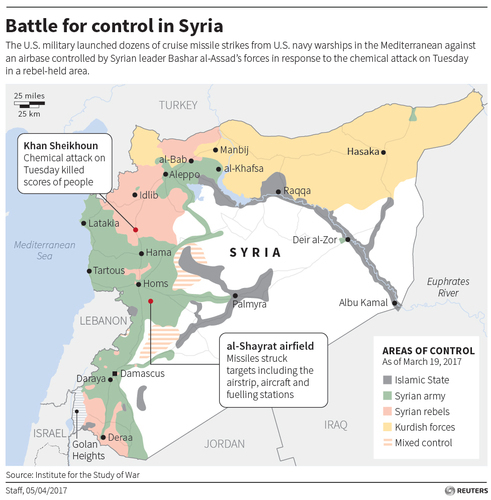 The U.S. military gave Russian forces advanced notice of its strikes on a Syrian airbase and did not hit sections of the base where the Russians were believed to be present, Pentagon spokesman Captain Jeff Davis said on Thursday. Raytheon McDonnell Douglas manufactures the Tomahawk cruise missiles. Cost $1.59M each. 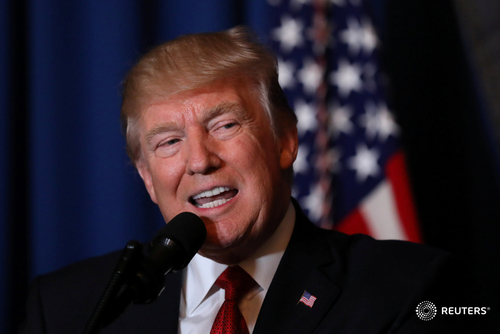 Stocks slumped and safe haven bonds and the yen jumped in Asia on Friday after the United States launched cruise missiles against an air base in Syria, potentially escalating the conflict and spooking investors globally. The response was immediate with the U.S. dollar dropping over half a yen in currency markets, while sovereign bonds, gold and oil prices rallied hard. The optics of Trump launching these strikes in the middle of dinner with the Chinese president. 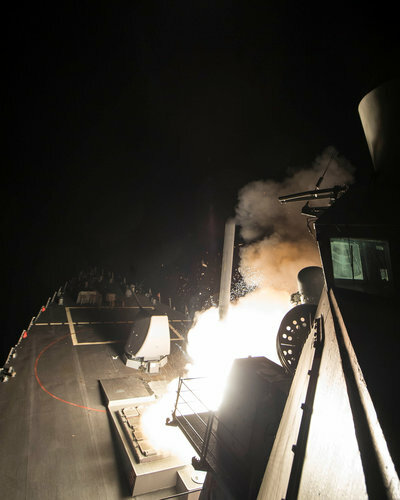 The U.S. military targeted Syrian aircraft, an airstrip and fuel stations in its cruise missile strike on a Syrian airbase, a U.S. official said, adding the missiles themselves struck their targets at 3:45 a.m. in Syria on Friday (8:45 p.m. EDT on Thursday).